Donald Trump will host “Saturday Night Live” for the second time this evening, as part of his ongoing campaign to win the Republican presidential nomination — but the outspoken mogul has long been in the ethos at 30 Rockefeller Center. 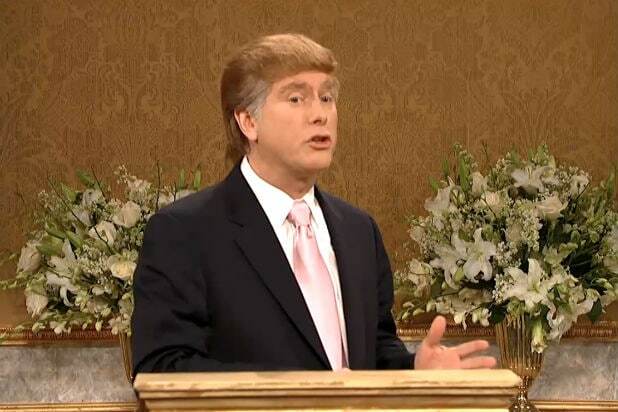 Aside from his hosting duties and network synergy thanks to his NBC franchise “The Apprentice,” Trump has been a parody target for the series, played mostly by impression pro Darrell Hammond. “When it gets down to an election year, I think it will start getting a little more humorless. But if any place can take someone and make them funny and at the same time make light of what they are — ‘SNL’ does a beautiful job of that,” said “SNL” writer and former Trump sketch author Paula Pell, who spoke with TheWrap in October about working with the candidate. Before the live show gives him a platform to charm late night viewers, as they recently did Hillary Clinton with a sketch appearance, here’s a look back at some of the best Trump send-ups from the past few decades. Jimmy Fallon and Tina Fey welcomed Hammon as Trump to the Weekend Update desk, where he did what he does best — insult everyone for doubting him. In this case, he’s taking a victory lap for that year’s successful “Apprentice” debut. Hammond’s Trump is making life miserable for an off-camera Seth Meyers, who is attempting to direct him in an ad spot for Domino’s Pizza. A boastful Trump states and overstates the obvious — something he himself inspired in the writers. During Trump’s first hosting gig in 2004, he demanded that his lines be written on cue cards to serve as backup during sketches — a standard “SNL” practice for every host. “We started writing him as Darell telling people the obvious — like, he’d say to the dentist, ‘You need to fix this cavity.’ Yes, he knows,” Pell said. One of Trump’s infamous sparring mates was former “The View” moderator and daytime talk icon Rosie O’Donnell. Public attacks on her appearance and worth made Trump a slow-moving train wreck for the media, as evidenced by this sketch that sees Donald unable to speak of anything else but his nemesis. Look out for cameos from “SNL” alums Amy Poehler, Maya Rudolph and Jason Sudeikis. The next phase of “Apprentice,” likely its legacy marker, celebrities were introduced as contestants vying for Trump’s approval. Hammond returns for more yelling, with “cameos” from Tom Green, Joan Rivers and Dennis Rodman (host Dwayne Johnson). Taran Killam took the reigns of the Donald impression with Cecily Strong handling his wife Melania, marking the beginning of what will likely be a very good election year for both. Shout out to Killam’s pout — easily the biggest evolution in the demeanor of the real Trump.